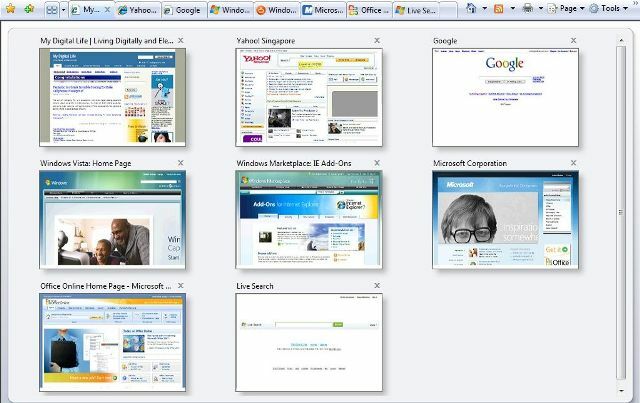 Beginning from Internet Explorer 7 (IE7 free download), IE has tabbed browsing feature where multiple web pages can be opened within tabs inside a single browser window. For users who like to use the keyboard for navigation, IE 7 has built-in several keyboard shortcuts to speed up tabs using and switching in IE7. Here’s a few commonly used keyboard shortcuts to accelerate usage of tabs in Internet Explorer 7 or newer, such as when want to jump or switch to another tabs. Middle mouse button on the tab or CTRL+W: Close tab and will close IE window if only one tab is left opened. CTRL+Q: Open Quick Tab view where a master window will display generated live thumbnail image of all tabbed pages. See illustration below. CTRL+SHIFT+Q: Instead of thumbnails, view list of all open tabs.